Description of "Plant and Soil Volume Three"
Plant and Soil Volume Three tells point to point how there are atoms in space and they are utilized by the plants to survive and grow. That crop production can be increased by sowing plants more densely. How adding nutrients to soil won't increase the plant population in a given soil and fertilizers are of no use. 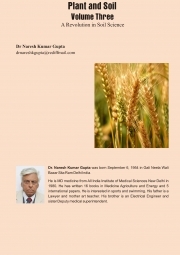 Dr Naresh Kumar Gupta was born September 6 1954 in Gali Neela Wali Bazar Sita Ram Delhi India He is MD medicine and has written 38 books in agriculture energy and medicine. Reviews of "Plant and Soil Volume Three"